In the Volvo Ocean Race Mike Sanderson and Team Sanya are pulling out the stops in their push to keep hold on the latest generation boats as the fleet continue on their predominantly straight line track across the Bay of Bengal today. Sanderson says the Sanya crew have been relentless in their quest for more speed despite Sanya Lan being the only previous generation boat in this edition of the race. ‘We have promised to ourselves not to just use the ‘old boat’ thing as an excuse for the speed deficit and to always keep hunting to extract every single fraction of a knot out of the thing,’ Sanderson wrote in his latest report from the boat. Last night Sanya abandoned their position as most southerly boat, choosing instead to tack almost directly north to re-engage with the fleet – a move which Sanderson confesses he may have called slightly too early. ‘Last night there was a little bit of action as we came out from underneath the large area of wind shadow that Sri Lanka casts onto the Indian Ocean,’ he explained. ‘On the eastern side there is a small convergence zone, like a mini doldrums where for a period the wind flicks from one side of Sri Lanka to the other. This gave a few of us in the fleet the opportunity to step north relatively cheaply miles-wise. Sanderson also announced the crew had finally named their latest lucky mascot in honour of their shore boss David Duff. ‘We have named our Dragon that has joined us as part of the team for this leg (at least),’ he said. ‘We decided that for sure he was a Magic Dragon, so Dave Swete (helmsman/trimmer) came up with ‘Puff the Magic Dragon’. In recognition of our COO, David Duff it would have to be ‘Duff the Magic Dragon’. 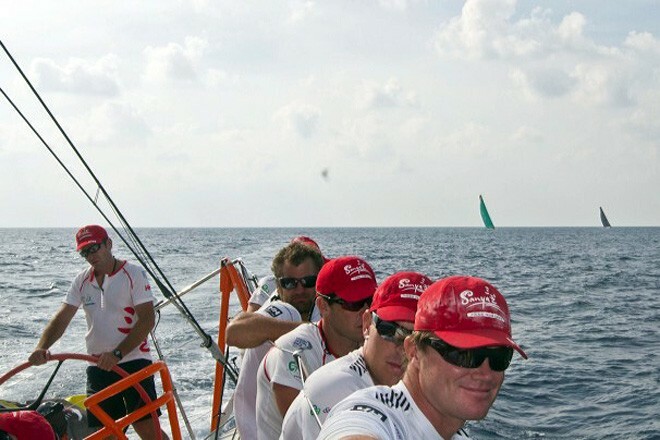 Having to work so hard just to stay in touch with the others means the Sanya crew are looking forward more than most to reaching the turning point at the top of the Malacca Strait, where they are banking on a chance to sail around the fleet. ‘All our efforts at the moment are to just try and stay close enough to the fleet in the hope that there is a parking lot as we enter the Malacca Strait,’ Sanderson confirmed. ‘Right now we are fully excited about the ‘Buffalo girl’ opportunities that are a real possibility,’ Sanderson concluded.